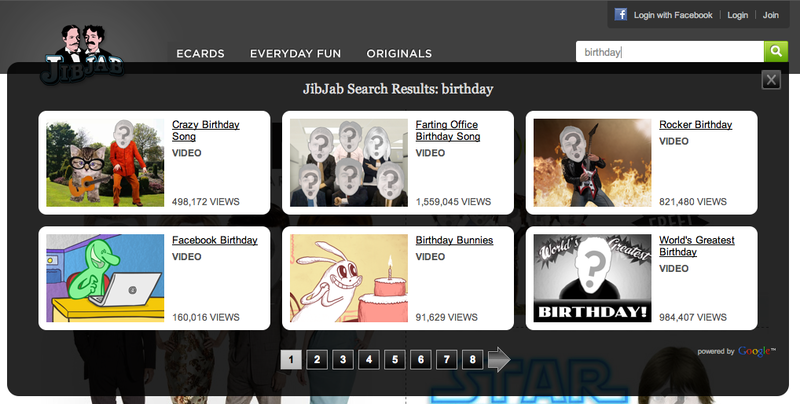 The folks at JibJab are good at doing two things: Making people laugh and... Okay, so maybe weʼre REALLY good at one thing: Making people laugh. Finding the perfect birthday eCard for your friends and family has always been a priority for us here at JibJab. We all felt that search would be the perfect compliment to our existing browsing experience and then we discovered Google Site Search ... our wildest dreams were about to become reality. Seriously. We get search functionality without having to build search functionality. The beauty of Google Site Search is that it can all be done with a small addition to your web page markup and no change to the back end of your web application. Using the PageMaps functionality Site Search provides, we are able to embed metadata in our web pages that will be returned in our Site Search query results. This lets us format the data you are looking for in a very JibJabby way. With features like Autocompletions and Reﬁnements, we will be able to evolve the Site Search functionality on our site and help our users make people laugh for a long time to come.